"1943 - Boeing WWII - Ad - Another Fortress is Hatched." 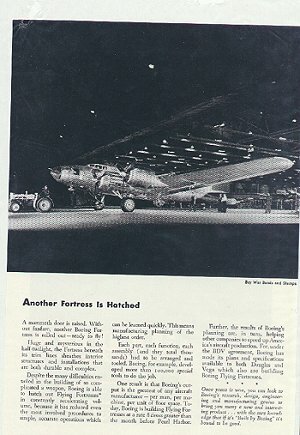 (1015) 1943 - Boeing WWII - Ad - Another Fortress is Hatched.- Condition: Very Good WWII Ad with a wonderful B&W Photo of a new Flying Fortress being pulled out of the Boeing Assembly Building. A text description is below the photo, and includes a description of the Making of the Fortress and a promise that once peace has been won their work will turn to research, design etc of a new Product. Ad measures 6 3/4" by 11". For more interesting information on The Flying Forstress visit B-17 Flying Fortress Price: $4.50 + Shipping.